I really want this book. Thanks for the opportunity to win it! I just love the piece you made from the book. I'd also love a chance to win it. I'm always open to new ways to use wire. Oops - My last post should have said that I posted to my blog. This post is to my Facebook page. Margot you do so much and I think thsi book would give me some Ideas and inspiration to make my jewelry even more creative. Would love to win book. You are awesome! Have a fantabulous rest of the week. A fantastic book! Just the thing for my hubby who has recently taken up wirework jewellery making and is looking for inspiration. Thanks for the opportunity to win. Something different, would love this book, seems to take wire work in a different direction. Thank you for the opportunity to win this wonderful prize. I would love a chance to win this book. 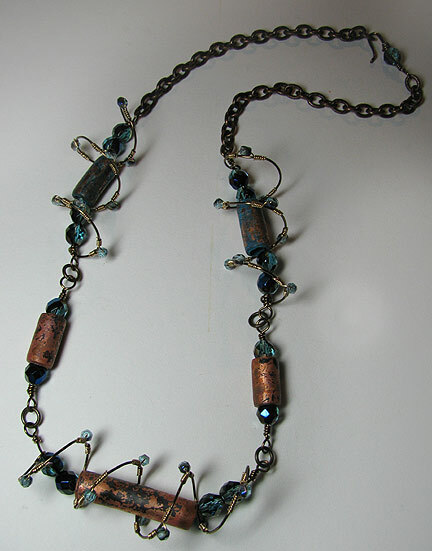 I love metal, especially copper and I'm always looking for new/interesting ways to use wire. Beautiful piece. 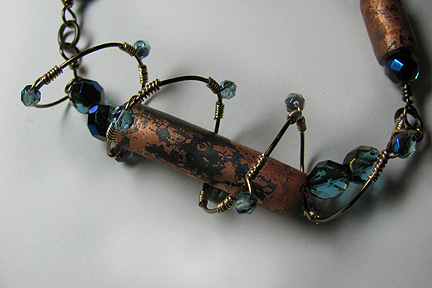 great way to add wire work to bring dimension. I would loove to win ! Would love to win this book! Thanks so much!!! Thanks for the great opportunity! The book looks fabulous! I just posted to my Facebook! Thanks for the chance to win. It looks like a great book full of inspiration. WOuld love to win the book! I'm a book junkie so would love another book! Margot's books are usually so full of fun! Thanks for the opportunity to win a copy! I would love to have this book, I love wire work! This book looks unbelievably awesome! Congrats to who wins it!! Posted on my Facebook...http://www.facebook.com/profile.php?id=100002888280616&sk=wall#!/kim.forni Add me if you need to see. Thanks for the chance to win such a great resource! Would love to win this. Thanks for the opportunity. Your necklace looks awesome! Would love the bok! I am a novice but I love to learn. This looks like a great opportunity. Thanks! I'm new to blogging, what a pleasant surprise to find such a lovely blog with such a lovely give away, thank you for the chance :) This book would be such an inspiration to my beading. Wow. I have yet to kick start my dream hobby of beading and if I win this book, it would be awesome. Thanks for hosting the giveaway. Fingers crossed! This week started out bad, let's finish it "winning"! This would be a super gift for my wire-working friend. I hope we win it. What a fabulous giveaway again! I would be super-dooper-mega thrilled to win this book! The cover alone impresses me --- excited to see the content inside. Thanks to the author and Cindy for giving away this awesome book. This looks like a great book! Thank you for offering it as giveaway! Thank you for this great giveaway! A wonderful book with wonderful ideas! Very cool, I love Margot's work. I'm a newbie, but I want to learn everything. Please, please pick me! Would love to win the book. Thanks for the opportunity. Love the necklace! Thanks for the opportunity to win the book too!